Essentially Eastern Rumelia - which became absorbed into the country we know as Bulgaria. 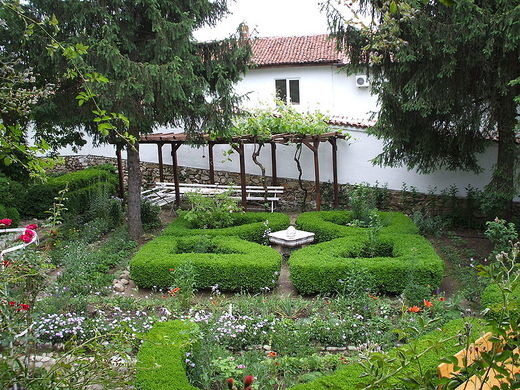 For Kazanlak is one of the chief places in the world for attar of roses, that powerful distillation of rose oil which was so highly prized in the courts and harems of the Orient, especially in India and Persia. … armies of men and women toil in the valley gathering the petals, culling them soon after dawn, before the high sun can drain them of the dew and the perfume which the night hours have been storing up. … and so concentrated is the essence which finally emerges that it takes over three thousand pounds of rose petals to produce a single pound of attar. 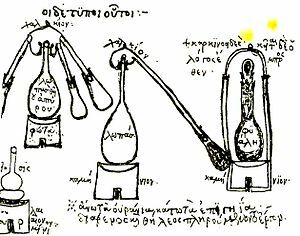 The valuable elixir is then bottled in tiny gilt and cut-glass phials, a mere thread of attar to each, and sold, understandably for enormous prices. The smell is captious, overpowering and a little cloying … at the heart of the rose harvest, everything in Kazanlak smells of it. … ahead to the north lay the Shipka Balkan, and I was soon climbing through the woods of walnut, oak and beech, empty except for an occasional swineherd and a swarm of razor-thin pigs: dark hairy creatures rootling for beech nuts and acorns which crackled underfoot. I hope like me … you can feel you were there with Fermor in his rose blossomed valley … before he walks north into the natural woodland decorating the low hill sides before the craggy mountains push their way forth towards the sky. 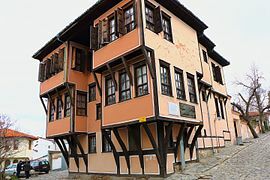 After writing this I have a hankering to also visit Plovdiv, the second largest city in Bulgaria, but in its recorded history usually known as Philippopolis, after Philip II of Macedon conquered it in 4th century BC. The city was a Thracian settlement later being invaded by Persians, Greeks, Celts, Romans, Goths, Huns, Bulgarians, Slav-Vikings, Crusaders and Turks … that’s a right mix of genetic heredity! Subsequently the Russians were added in to the mix … as they liberated Eastern Rumelia, a large swathe of land, from the rule of the Ottomans. 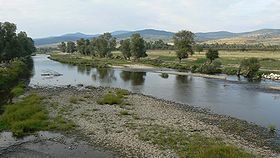 … as well through the valley of crimson, yellow-centred Damascus roses through which the Tundzha river and its tributaries flow slowly meandering across the landscape. I can imagine this place … and as it is five years ago that my mother passed on … this is dedicated to her as she was passionate about her flowers as well as learning in any way she could. He was an incredibly evocative writer wasn't he? I don't think I have ever read any of his travel pieces without longing to see the places he wrote about for myself. A lovely post for your mother - who passed her love of learning on to you. As usual, I didn't know half of this, Hilary. 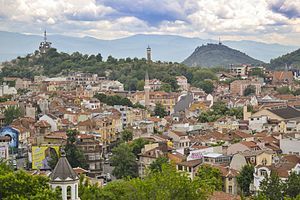 Sounds like Plovdiv's the place to go! I lovely dedication to your mum. I still miss my parents and its nice to catch myself appreciating things they would have enjoyed; I think that's how people we love stay with us. That Lamartine House is wild. People like roses for the flower but I never considered the oils made from them. what a treat to enjoy. I can never have enough of their scent. I learned so much from this post. I really knew nothing of Bulgaria or distilled elixir of roses! The rose bush near our front door doesn't let you forget it's there; it can be smelled from four meters away! Gosh - you learn something every day that you are on earth. I love flowers, but not too good at raising them - but I did love that rose. I also had no idea that you could get oils from them. Thank you. I love what Mike said. My Grandmother's memory floods me whenever I smell roses. She scented everything with rosewater. That valley would be heaven. I always have a bottle of rose oil on hand to put on certain spots in the room when I feel like roses around. I am lucky our roses all have a great perfume, and walking around Pons earlier this year in the park, I have never smelt roses in the air so strong, it was amazing with beautiful rose beds everywhere. I wonder if they had the Damascus rose there. It seems a pity that so many roses in this day and age have no perfume at all. Another great post with masses of interesting info. Well done Hilary. Three thousand pounds? Of rose petals? That's a lot of Rose petals. Sounds like a fascinating place. Eastern Europe and the Balkans have such an interesting history. That is a lot of roses needed. Then again, it takes a lot of rose petals to make a parade float. 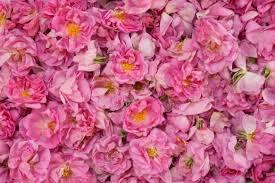 I think that Attar of Roses is the most popular fragrance ever used and still very widely used today amongst al types of people and for many different reasons ranging from perfumes to medical reasons. Gorgeous writing. Beautiful images, too. Thanks. 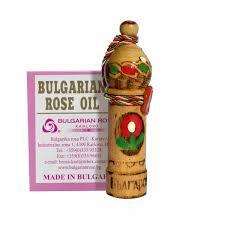 I never knew Bulgaria was famous for their roses or rose oil. Definitely learnt something new. Hope you are doing great, Hilary. what a nice dedication to your mom. my mom loved roses and always had a big garden full of them. my favorite was a bright orange one called Tropicana. funny i still remember the name of that one. i remember the garden smelling so nice and my mom being so happy when she was out there tending to the roses and all the flowers. i think it's kind of sad to destroy so many beautiful roses just to get a little attar to sell to people who are rich.but it sure is a beautiful sight to see before they remove the leaves. That's a lot of roses. I certainly hope the attar is worth the trouble. Although, I wonder if anyone needs such a dense concentration. Sounds like a wonderful place to visit and I can almost enjoy the scent through my laptop. 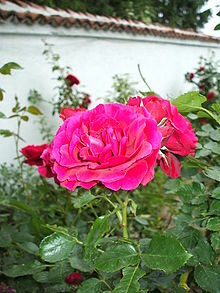 Ecuador exports a lot of roses but many varieties here are grown for beauty rather than aroma. I love it when I run across strong scented roses here, the kind where a small bouquet fills the air with amazing rose scents. What beautiful prose - I can understand why you'd be tempted to follow in his footsteps. I have a heady whiff of the roses - rich and thick. Wow. Tough to sustain good roses in Texas - the weather is so extreme. However my neighbors are originally from the UK and they have a lovely selection every spring. It must be in the genes. Hundreds of thousands of rosebushes! Wow. The sight and scent must have been amazing. I loathe imitation rose scents, but the real thing can't be beat. @ EC – Fermor is extraordinary … reading his words again – they ring delightfully true giving one a heady mix of the views, aromas and history ... 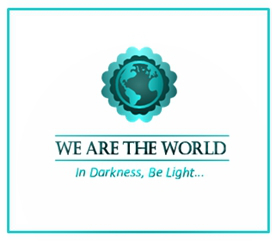 I love it – and like you want to visit. @ Diane – of course if we go the parade float route – then I can see lots of petals being used there … I didn’t think about that. @ Murees – good to see you – yes it’s an interesting history lesson, something I didn’t know about. @ Lenny – so lovely seeing you here – and I’m so glad you appreciated the dedication to my Mama – how fantastic this post brought back memories of your mother … and you can remember her favourite: ‘Tropicana’ – it is certainly a big blousy rose – and I see has a fully fruity fragrance – with a wonderful colour … coral orange – I agree it looks gorgeous. Those memories are so precious for you … and it’s wonderful you can remember the garden and being with her when she was so happy. It is sad to destroy the flowers – yet in doing so … they give pleasure to so many others … earlier in history – they’d have helped ‘eliminate’ some of the rather odorous smells that would have been around. @ Emily – that’s great you can ‘scent’ the fields of attar through your laptop. Now you mention that South America and Ecuador exports lots of roses … I’ve seen that … in fact I’ve posted about them somewhere, but can’t for now find it! @ Susan – the valley must be full of them and so heady with scent – wonderful. I am totally with you – I too loathe false scents, sadly people seem to live with them now-a-days – they are my bete noire! The real is just perfect … nature at its best. wow what a wonderful description of the roses and their smell. It made me feel like I was there. The scent of hundreds of rose bushes... wow!!! 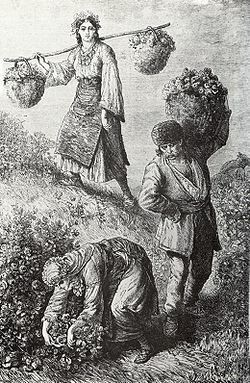 I had no idea Bulgaria was such a big producer of rose oil. I use it on my altars, always makes me smile when I smell the rose scent. So lovely. The words sound intoxicating just like these rose petals! I would love to smell these roses and I dropped my jaw learning how many petals is needed just for a small amount of this perfume. Love that house and always reminds me how they avoided the tax man. Bulgaria? Roses? Who knew--?? Thank you, Hilary. That's fun. I have never heard of that. Loved the map. Oh what a rich intoxicating journey Hilary, and what a lovely tribute to your mother. As a natural perfumer I've been working on a rose based perfume these past months, and I've loved loved loved working with a variety of rose oils. I can only imagine what a delight traveling the pink-glowed rose trails of Bulgaria must have been. Rosy blessing to all! What a fine and beautifully scented post to dedicate to your mother. I love roses, so wonderful to look at and the smell . . . reading this I could imagine the aroma. 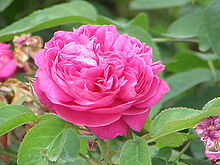 I am intending to plant some scented climbing roses in our garden. All the best, Hilary. I could actually smell the roses, what a wonderful writer. Shall keep my comment mercifully brief. Such rose-enhanced aromatic quotes from that clever author. It all makes scents to me. Have a wonderful Sunday, Hilary. @ Birgit – intoxicating is a good descriptive words for his show of the landscape … masses of petals to make a small amount of oil – then miniscule portions taken off. It's so gorgeous. I guess I'd never considered the real history of roses, but this was pretty incredible. Thank you. Oh my gosh. I can't imagine. Talk about a corner of heaven or Shangri-la. PS And what a lovely tribute to your mom. Flowers and learning, the best things ever. 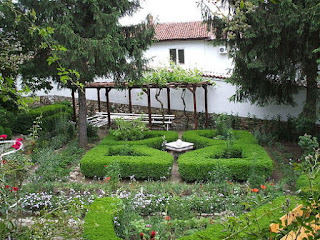 I knew nothing about distilling roses and I also learnt more about Bulgaria than I ever did before. Another excellent post! Roses are so beautiful and fragrant but a difficult flower to keep up with. They take real dedication to keep them from returning to their wild state, or to keep free of disease and such. I love them though, and when I've had them in my garden I'd pick bouquets in June to bring into the house. 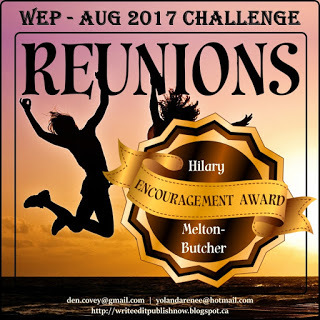 Fermor sounds just up your alley Hilary. I loved the descriptions of the roses. The petals falling by the wayside reminded me of cotton picking in NC and one sees bolls of cotton having fallen out of their sacks as the trucks haul them to the mills. No scent as far as I am aware anyway. The modern roses don't have the perfume of the older ones. Used to really love them in my garden in the UK. I'm imagining the rose scent in the air. I struggle with my small patch of roses that seem to share their pollen so that I can't tell when one is going to be red or white or a bit of both. I'm also imagining 3,000 pounds of rose petals. That's one heck of a lot of rose petals. This is a perfect way to pay tribute to your mother. What a spectacular site that must be when in full bloom. I wonder if it get hard to breathe in the distilling rooms. Roses can be so heady and thick when there are so many of them. I can't imagine that many roses. And so many to make a tiny bit of attar. It would be an amazing tour to take. @ Crystal - oh gosh allergic to roses ... how sad - I know some people are - some of the nurses used to say to me ... oh no - fresh flowers when I brought them up to my Ma - she loved them - because of their allergies. Your story about your hubby sending you those flowers ... must make you laugh now - but frustrating then ... and great for your room-mates ... so glad you dried them and kept them .. .
Oh how lovely! What a vivid description. I can imagine being in a valley of roses and the scent is fresh in my nostrils. Thank you for taking us on this journey. That house is sure weirdly set up, in a good way. Never thought about them coming in oil form. Wow, everyone wanted to invade too, quite the genetics indeed. So lovely that roses make you instantly think of your mother. Lovely post and very informative! Makes me want to visit Bulgaria. @ Nila - wonderful writing isn't it. Since I've been reading Fermor's books I've been constantly delighted with new references ... and this valley just entranced me. Oh I can see the savings you spend on floral scents ... I don't do them either - fresh flowers or one 'parfum' Lanvin Arpege: that's me. 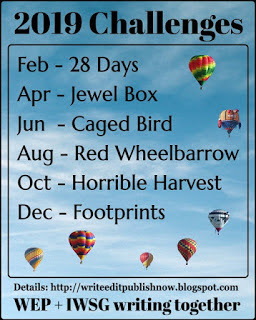 @ Jess - his writing is quite extraordinary ... beautiful descriptions. I'm sure the aroma is overpowering in the fields and at the factory ... but heavenly too. I definitely have a hankering to visit. 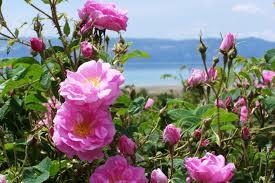 Just glad Bulgaria and its roses enticed ... wonderful. Looks fascinating. Hopefully you'll be blogging about your trip. Hope the rest of your week is productive and pleasant. @ Sage - when I get to do the trip .. it will be fascinating ... and I will definitely get up to the Rose Museum and valley ..